VANCOUVER — A family dog saved his eleven-year-old owner Saturday when he stepped between the boy and an advancing cougar, according to the RCMP. The boy, a resident of Boston Bar, B.C. was gathering firewood in his backyard when he noticed the predatory cat advancing across the yard. 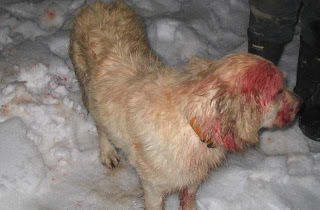 As the cougar charged, the boy's pet, a golden retriever, intercepted the attack. The family called police as the dog and cat battled beneath the back porch of the home, until a Boston Bar RCMP officer arrived and shot the cougar in the rear end — which, said media-relations officer Sgt. Peter Thiessen, "was the only part of the cat that was visible." The dog incurred minor injuries and the boy was unhurt.